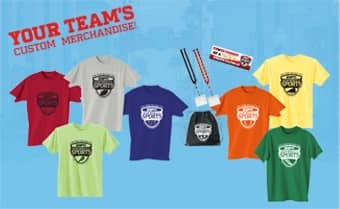 Prepare for your Walt Disney World Resort trip with customizable team merchandise! Commemorate your experience with ESPN Wide World of Sports Complex merchandise from one of our official retail locations. Exclusive apparel, hats, Disney collectible pins and a special Vinylmation figurine make fun keepsakes. Don't forget to take some time out before or after the game to shop for your favorite items! 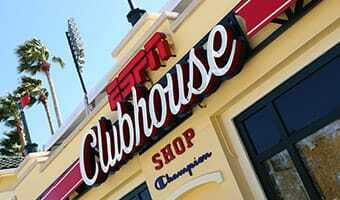 The ESPN Clubhouse Shop is the place for the ultimate sports fan where you will find the largest assortment of our exclusive ESPN Wide World of Sports apparel and gifts. You will also find merchandise from some of your favorite professional sports teams. With two locations, one adjacent to the Box Office and another inside Champion® Stadium, it's a sports fan's shopping dream come true. The Custom Tee Center by Champion® is a new experience where you can customize your sports event tee. After purchasing an event tee-shirt at one of our retail locations located throughout the complex, take your tee to the Custom Tee Center by Champion and choose from more than 50 designs that can be added to commemorate your accomplishment, like 1st Place, Champions, Team Captain, and many more! 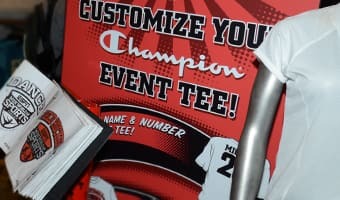 Look for the Custom Tee Center by Champion® just inside the entrance to the ESPN Wide World of Sports Grill. Exciting, state of the art mobile locations will also be available throughout the 255-acre sports complex during select events. Excited about your visit? Get in the game with customizable ESPN Complex merchandise for the whole team! Learn more about printing your team name on t-shirts and sports bags available in a variety of colors, and then take your skills to the adrenaline-pumping next level by playing at Walt Disney World Resort—right in the middle of the magic! Additional merchandise locations can be found throughout the ESPN Wide World of Sports Complex during most events. Find apparel and headwear to commemorate your event experience and other souvenir items with the convenience of not having to leave your competition venue.